Posted on 6, June 2016 by EuropaWire PR Editors | This entry was posted in Aviation & Aerospace, France, Germany, Technology, Transportation & Logistics and tagged Bartolomeo, David Parker, François Auque, ILA Airshow, ISS, the International Space Station. Bookmark the permalink. 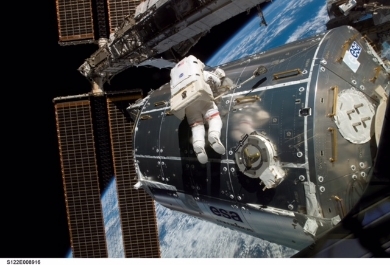 BERLIN, 06-Jun-2016 — /EuropaWire/ — Airbus Defence and Space, the world’s second largest space company, and the European Space Agency (ESA), agreed today to start a joint pilot project phase to prepare the operation and utilization of a new external payload platform on the European International Space Station (ISS) laboratory Columbus. ESA and Airbus Defence and Space signed the corresponding Memorandum of Understanding on June 2, 2016 at the ILA Airshow in Berlin (Germany). The Bartolomeo platform is envisioned to be embedded into an end-to-end service designed to provide fast, cost-efficient and reliable access to the ISS for private and institutional users on commercial terms. The Bartolomeo all-in-one payload mission service is aimed at customers from areas including Earth observation, technology demonstrators, astro- and heliophysics, material science and new space flight applications. This new space facility, named “Bartolomeo” after the younger brother of Christopher Columbus, will be attached to the outside of the European “Columbus” laboratory module in 2018, providing access to power and data resources for customer payloads. With almost 20 years of experience in the field of unpressurized cargo transportation and operation, this initiative strengthens Airbus Defence and Space’s position as a provider of human spaceflight-related system solutions and end-to-end payload operation services.